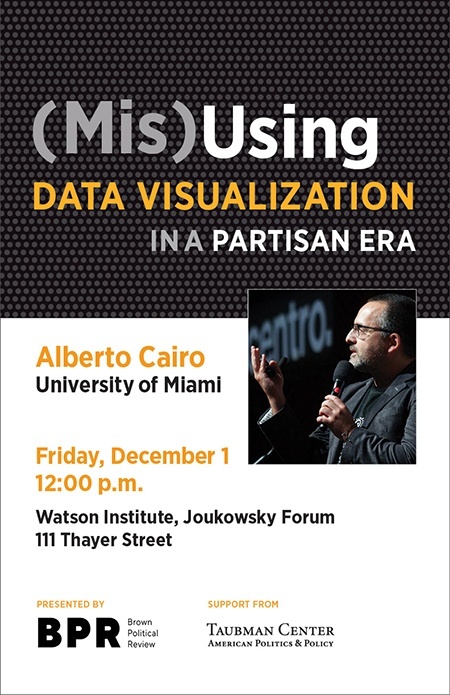 Join Brown Political Review for a talk by data visualization expert Alberto Cairo. Cairo will explain how to decode misleading charts, infographics, and data maps -- the visual aspect of “fake news” -- designed by individuals and organizations from across the political spectrum, and discuss why a graphically literate citizenry is essential to political and policy debates. Alberto Cairo is a professor of professional practice at the University of Miami and a Knight Chair in Visual Journalism at the Knight Foundation. He holds a BA in Journalism (University of Santiago de Compostela) and a research-oriented Masters degree on Information Society Studies from the Universitat Oberta de Catalunya (Barcelona). He teaches courses on information graphics and visualization, and is interested in the convergence between visual communication, journalism, cognitive science, cartography, and statistics. Cosponsored by the Brown Political Review and the Taubman Center.